The Earth revolves around the sun. Most of us have reduced this to an abstract, the calendar. We can know it's June without leaving a windowless room. The Earth spins around its axis. Most of us have reduced this to another abstract, the clock. We can know the time by looking at our watches, again without leaving our windowless room. I have a lot of discussions with other science teachers that start with "I cannot believe they don't get this..."
And I'm starting to get why they don't get things. My students live in a windowless world, fed through electronic media. Even numbers have lost much of their meaning beyond symbols on a hand-held machine. If you have no reference beyond your windowless room, you don't have any particular reason to "get" anything unless a penalty or reward is attached to getting it. So we test and test and test some more. And the kids keep not getting it. I am going to drag my children outside of their windowless rooms. Next year I am starting a phenology project in class. First lightning bug two nights ago, a few more last night. 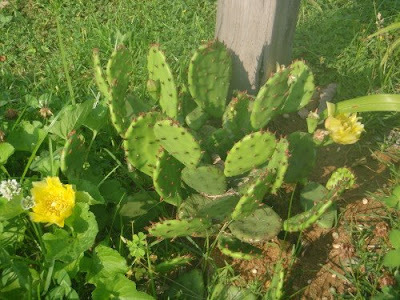 The prickly pears have been blooming for 10 days now. The croakers will be moving near the jetty's any day now. Phenology is the study of the periodic cycles in biology--finding the first robin of spring is phenology. Chasing the peak fall foliage in New England is phenology. Me telling kids that on average lightning bugs start their mating rituals mid-June is abstract, no matter how fancy the projector or the font. Sending them outside each night to find a lightning bug doing its thing reconnects children to the real. Phenology is old-fashioned observational high school biology. You can do it without knowing anything about macromolecules. Biology traditionally precedes chemistry and physics in high school because back in the 1890's, that made sense--biology was was a lot easier. High school biology today requires biochemistry, and asking 15 year olds to process macromolecules a year before they have studied chemistry is going to lead to a lot of not getting it. So I am going back to the 19th century, but I'll add a 21st century twist. We'll start a class blog. I've just changed offices to one with a window. I'm curious to see what effect it has on my school administrator soul. Also I wanted to let you know I'm reaping the rewards from my garden. This evening I dined on leaf lettuce, scallions, pea pods, and spinach all from my little square foot garden. I've taken more joy from my little 8 x 4 foot patch than I can put into words. Your posts are what encouraged me to give it a try. I'm eyeballing some cherry tomatoes for next week. Can't wait to read that blog! I have no doubt that students will remember the night they hunted for the first lightening bug rather than the night they tried to memorize info from the Bio book. Although I have become somewhat of a realist over these few short years as a teacher. There will be a few who cannot be torn away from facebook, wii, MTV, Iphones, or whatever else has them in its steel, mind-numbing grasp. I read somewhere that Alzhimer's is predicted to dramatically rise for my generation; we barely use our brains for output, meanwhile the input is flowing at a feverish pace. That sounds wonderful, an enjoyable and meaningful learning experience for your students! I teach art and one of the things we talk about at the start of the course is how scientists used to record images before cameras, i.e. they had to draw from observation. You might want to ask the art teacher to collaborate - send along some art students to do some sketching alongside the science students observing. Just a thought...! I checked out my new class as a computer teacher. It's sterile and empty and quiet, save a few buzzing computers. Don't get me wrong, it's nice, much nicer than I am used to. I hung up posters and kept thinking, "there's something wrong." I thought it was the lack of murals (I haven't gotten permission to paint on walls) but then it hit me, "I'm in a cave." The school is all indoors. They say it's more eco-friendly this way. It might save electricity, but I'm not sure that a windowless school helps kids become friends with the ecological surroundings. At my last school, I stood in the sun for four minutes every hour. I knew the time by the shadows on my class walls. Now, I'm stuck trusting the clock. Most of us are lost, but I'm not sure that's the real problem--I suspect most of the lost do not realize they're lost, and that scares me. Your students' blogging inspired me. I'm really excited about this. What kind of permissions did you get before blogging? I like your suggestion! I'd love to collaborate with the art teachers. "Drawing from observation" teaches more than any textbook illustration. If you're as much like as as I suspect, you'll never quite trust the clock. Hang in there--I am ecstatic that I am getting windows! I've shared this before, but I like it, so I'll share it again. I've enjoyed Friends' (Quaker) Meetings, mostly silence, punctuated every very now and again by someone moved to speak. At many meetings, no one speaks. I watch the shadows move, I look at the grain of wood in the pew in front of me. Outside the window is a telephone line. I keep thinking about the finite digital information transmitted through that wire, then about the infinite variety of life surrounding that wire. I love windows, but I'm not a fan of Microsoft. Can you share your plans for the assignment? I'm researching information for something similar for my students to do this year, but ecology isn't my favorite topic, either, so I'm not sure how to go about creating something do-able. Any ideas you can share would be appreciated. Sure, but I've not distilled it into a formal lesson plan yet, one because it's still summer and I play a bit, and two because our district is modifying lesson plans to fit in with UbD. Blogging: students will blog their findings biweekly. While open-ended observations are encouraged, the teacher will also provide a checklist (with appropriate identifying data) as scaffolding for students as necessary. Assessment: I could make this quantitative, I suppose, and I may for those students shooting for a "C", but I may get bold and judge the entries on the quality of the observations. I'll write a rubric, of course, but we're only kidding ourselves with these. Quality is elusive, sometimes impossibly so, but we do recognize talent or art or whatever you want to call it. Anyway, just rough thoughts--I should have the actual lesson plan written by September 10--email if you want it.